Pigeons belong to the taxonomic family Columbidae, which contains more than 300 species. Genetically speaking, there's no distinction between pigeons and doves, and the terms are sometimes used interchangeably. 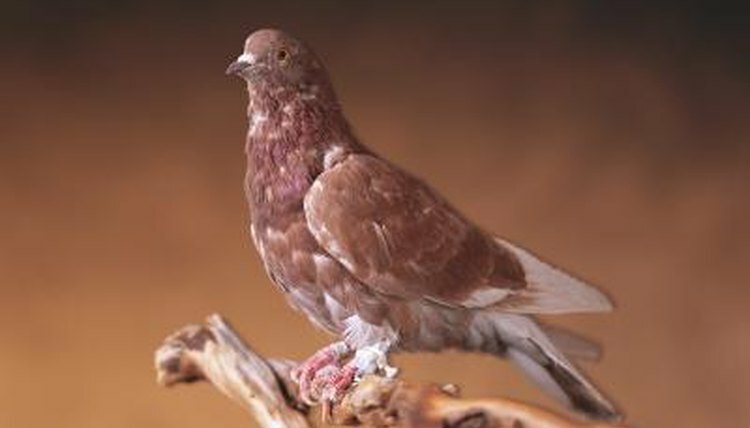 Usually, the name pigeon is used to describe some of the larger members of the Columbidae family. Depending on the species, different pigeons should be fed different amounts of food. Before deciding how much to feed your pet pigeon, you should know what to feed him. Around 50 percent of your bird's diet should consist of a high-quality seed mix or pellet that's formulated for pigeons. Pellets are best, as they're well-balanced, but a pigeon seed mix will suffice if you can't find specialized pigeon pellets. The remainder of his diet should be made up of various fruits and vegetables. Feeding a wide variety is essential to maintain proper nutrition. If your pigeon refuses a certain type of food at first, keep trying as he may get used to it. The exact amount of food that your pigeon needs depends on his size, species and level of activity. Each morning, you should feed your bird an amount of food that he can finish by sunset. If any is left over, he's being fed too much. Start out by feeding him 2 tablespoons of seeds or pellets and the same amount of chopped fruit and vegetables. This should be on the generous side, so if there's still food left at the end of the day, slightly reduce the amount you feed him each morning until he's eating the full amount by sunset. Your pigeon can eat almost any kind of fruit or vegetable; the more varied his diet, the better. However, avocados are potentially toxic and should be avoided. Pale vegetables containing a lot of water -- such as celery or iceberg lettuce -- don't contain many nutrients, so shouldn't be fed in high quantities. While it's OK for your bird to eat some human food, avoid feeding him anything too fatty or processed. Junk food, alcoholic beverages and caffeine are all a big "no-no." Since pigeon pellets are carefully balanced, if your bird is eating a diet composed of 50 percent pellets, he may not need supplementation. However, it's best to consult an avian veterinarian to assess your pigeon's individual dietary needs. If your bird doesn't spend any time outdoors, he will likely need to be supplemented with vitamin D, as he can only produce it himself if exposed to sunlight. Calcium supplementation is important for laying hens, as it's essential for healthy egg formation.